Discussion in 'More Accessories' started by gius, Jan 4, 2010. Has anyone worn glasses like these? 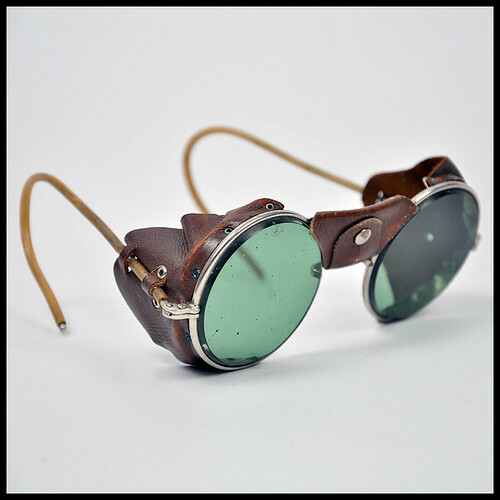 --originally, the extra pieces on the sides are made to block your vision in a certain area. Intended for horses.. I wonder if that happens with the designer "human" glasses. Does it seem safe at all.. Blinders, also known as blinkers or winkers, are a piece of horse tack that restrict the horse's vision to the rear and, in some cases, to the side. They usually are made of leather or plastic cups that are placed on either side of the eyes, either attached to a bridle or to an independent hood. Blinkers that have a peep hole cut in the back of the cup are known as visors. Many racehorse trainers believe these keep the horse focused on what is in front of him, encouraging him to pay attention to the race rather than other distractions, such as crowds. Additionally, blinkers (then usually known as winkers) are commonly seen on driving horses, to keep them from being distracted or spooked, especially on crowded city streets. A “set of winkers” can refer to the whole bridle, particularly the heavy bridle used on draft horses. I think I've found them here. i also wonder about the safety..I know they wouldn't work for my bad eyes!